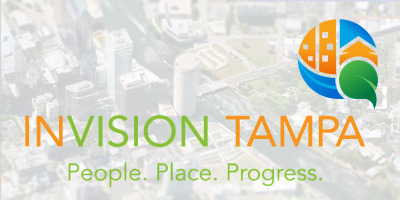 The City of Tampa is forging ahead with Invision Tampa plan. In May and June, more than 200 people attended workshops to discuss the future of Julian B Lane Riverfront Park, located just across the Hillsborough River from downtown Tampa. One concept under discussion is re-aligning Laurel Street further north along I-275 to make more room for recreational space within the park. The master plan for the new and improved Julian B Lane Riverfront Park wraps up this Fall, with another public workshop scheduled for September 9. Design and reconstruction will follow the planning phase. In 2011, the City of Tampa began creating a master plan for Tampa’s Center City, spanning from downtown to Ybor City on the east, Armenia Avenue on the west and north along historic Nebraska Avenue to Hillsborough Avenue. The City walked, talked, photographed, mapped and – most importantly – listened to residents about the nuances of their neighborhood, as well as the things that matter to them and their families now and in our future. In November 2012, the Center City Plan was unveiled. From the completion of the Tampa Riverwalk, to the restoration of the Federal Courthouse, the evolution of Encore, and the construction of downtown residential towers, the Center City plan is actively shaping the future of downtown. More recommendations are in the works. Next up is the West River Redevelopment Plan, focusing on a 120-acre area bounded by Rome Avenue, Columbus Avenue, the Hillsborough River and Interstate-275. The plan recommends reconnecting the streets and blocks to each other, strong ties with public education and community services, a keen focus on linkages along the Hillsborough River. For more information, contact InVisionTampa@tampagov.net.